The wonderful shape of the pink Ladys Slipper (Cypripedium acaule) makes it one of my favorite woodland flowers. Sometimes known as the moccasin flower, the magenta pink of this showy member of the orchid family brightens the New Hampshire woods in late May and early June. 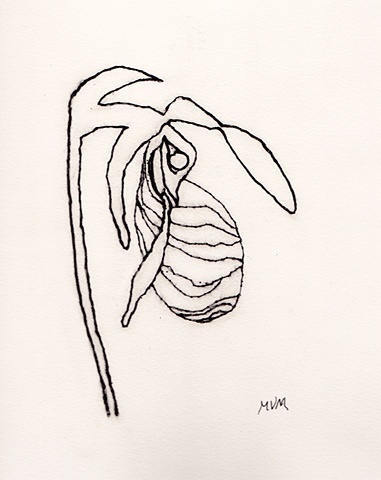 This relief print of a stylized image of a lady's slipper was printed from inked thread, stitched into a flexible plastic paper, Yupo ®. Edition of 6.